On Sale! Save $2000 on this one, we've marked it down from $35288. With a brand new design this 2015 Mercedes Benz C Class is looking better than ever with a stunning new design both inside and out. 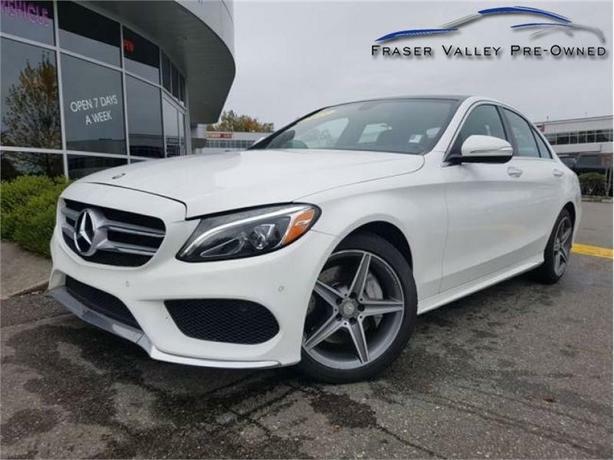 This 2015 Mercedes Benz C-Class is for sale today in Abbotsford. The fully redesigned 2015 Mercedes-Benz C-Class is up a bit higher in terms of luxury and prestige. A little longer and a lot lighter, this C-Class sedan furthers its successful formula with new four- and six-cylinder engines, world-class interior refinement and safety features that lead the segment.This sedan has 61480 kms. It's white in colour. It has a 7 speed auto transmission and is powered by a 329HP 3.0L V6 Cylinder Engine. It may have some remaining factory warranty, please check with dealer for details. Buy this vehicle now for the lowest bi-weekly payment of $216.87 with $0 down for 84 months @ 4.99% APR O.A.C. ( Plus applicable taxes - Plus applicable fees ). See dealer for details.